Killers stalks a private investigator as he tries to save a dying child. A beautiful woman begs a private eye to find the bank-embezzler lover who left her pregnant. She says the fugitive’s bone marrow could save her daughter. The trail has been cold for 14 years! That’s the least of the investigator’s problems. He almost immediately becomes the target of a deranged mobster. Only a mysterious guardian angel – with an automatic pistol – keeps him alive long enough to find the missing man. Then things really get weird! If you like a great mystery, replete with crackerjack detection, unexpected betrayals and sparkling dialogue, then CAPRIATI’S BLOOD, the first of the Alton Rhode novels, is just a click away! If you ever saw a picture of Lawrence De Maria's Alton Rhode, the protagonist of "Capriati's Blood," it might come with a caption "Generic Fictional PI." Rhode's character fits the typical gumshoe resume to a T, down to the last cliche. He's an ex-cop with a biting, sarcastic wit, struggling financially, with a penchant for beautiful women and a tendency to find himself the target of a stray bullet or fist every few chapters. In fact, although I just finished "Capriati's Blood" a few days ago, the only thing I remember about his character is that he either went to bed with or was propositioned by every female character under retirement age in the book. But, although Rhode's character is very familiar, author De Maria make the book original enough in other ways so that it’s a fairly enjoyable read as a whole. Rhode operates in Staten Island, a borough of New York that's rarely the setting for books of any sort, and he's managed to make the acquaintance of about everyone important on both sides of the law on the island. Rhode lands a very familiar type of case, finding the long missing ex-boyfriend of an attractive actress named Ellen James, with a most unexpected twist. Ellen has a daughter by the titular Mr. Capriati, who ran out on her 14 years earlier, and their daughter has cancer. Further, Capriati may well be the only matching bone marrow donor they can locate in time. Since Capriati went to college on Staten Island, Ellen decides to hire a local PI to dig into his background. Needless to say, there's more to the case than first meets the eye. It seems that Capriati was friends in college with the man who's now the head of the local Italian mob and that Capriati's disappearance may have a mob connection. And, not surprisingly the investigation results in attacks on Rhode and a dead body turning up. However, despite the familiar elements, the solution to the mystery is quite unusual, involving a twist that I both completely didn’t see coming and that I can’t recall having seen before. Plus, Rhode proves to be a shrewd, methodical investigator and not merely someone who stumbles around for a few chapters until the case solves itself. “Capriati’s Blood” offers some other reading pleasures as well. 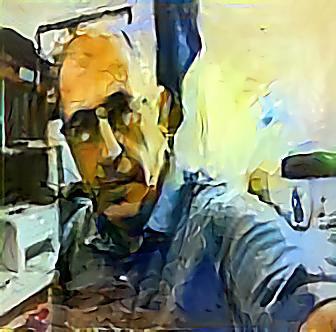 Author De Maria is a former journalist who got his start on a Staten Island newspaper (his first assignment, at the local courthouse, wound up with him meeting Roy Cohn and John Gotti), and the author’s knowledge of the borough shows up in some highly entertaining descriptions in the book. I especially enjoyed the scenes set in a local pub that the local cops and mobsters both frequented, often literally bumping into each other. Also, as befits a wise-cracking private eye, the author gives character Rhode a lot of clever quips and putdowns. Of course, those quips and putdowns come at the expense of a couple of highly convenient foils. De Maria goes out of his way to create a couple of obnoxious jerks, a college professor and a medical bureaucrat, whose only function in the book seems to be to serve as Rhode’s verbal punching bags. Those two buffoons are merely part of a larger pattern in the book in which situations resolve themselves in highly unlikely and even more highly convenient manners for Rhode. In particular, the manner in which Rhode gets through his final showdown with the book’s villain is the literary equivalent of air escaping a leaking balloon. Overall, the clever central mystery, the wit, and the evocative descriptions all through the book make “Capriati’s Blood” an enjoyable read, despite the stock characters and ridiculous contrivance at the end. I sense that the author wanted to keep this book short (it is barely over 200 pages) and, for that reason, took some shortcuts. 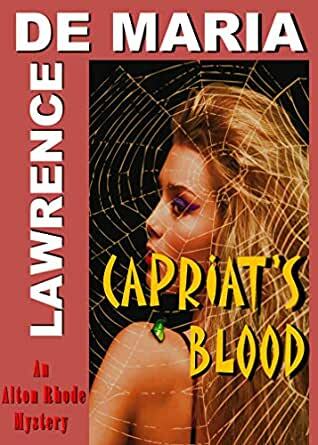 Since “Capriati’s Blood” is the first in a series of Rhode novels (none of the others of which I have read), this just might be some growing pains on the author’s, and the character’s part. As for the present book, “Capriati’s Blood” may be formulaic, but De Maria does a good job of following the formula. This is the third of Demaria's novels I've read (second Alton Rhode), and he's continued to entertain with witty, plausible adventures for his protagonist. Local color and quirky supporting characters, in a variety of settings - particularly Staten Island - ground the scenes in comfortable familiarity until flashes of brutality and unforeseeable plot twists jar the reader back into the noir theme. An engaging page-turner, Capriati's Blood gets 4 stars instead of 5 because the author introduced two love interests for his wisecracking detective. I found this a bit awkward, to the point of questioning whether at least one was contrived raciness. Neither subplot harmed the story, but the too-easy infatuations were a speed bump for me. I have this book only three stars because of the many errors. I must admit up front in the interest of full disclosure that I bought this book because the hero is named Alton. An unusual name that I happen to share thanks to my mother. However, once I started the book, I was hooked. A fast paced, interesting and well told story. Excellent dialogue with lots of humor included. Alton is hired to track down a missing father for a bone marrow transplant. But things are never as simple as they seem. Quirky characters, plot twists, excellent descriptive details make this a good read. De Maria sets the scene so well that it is like being there. He describes the locale so clearly that I found it reminiscent of Louis Lamour, except Staten Island rather than Wyoming. The PI, Alton Rhode, reminds me a little of Travis Magee.